Hi friend! I hope you’ve been having a fabulous week! Things are finally starting to calm down a little bit after the craziness of the last month and I am starting to get SO excited for the holidays. With holiday season often comes invitations to potlucks and parties, which can sometimes derail your healthy living goals. But I’m not one to tell you to sit at home or forgo all the treats at these events. No way! It’s way more my style to give you delicious recipes that you can bake-and-take to your parties so that you can indulge and wow people with your amazing kitchen prowess. 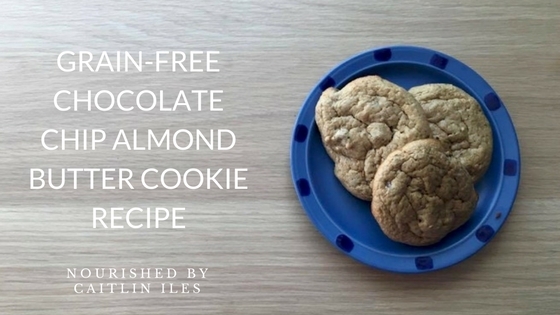 This recipe was created one day when I just needed a treat but didn’t want to make a regular cookie filled with blood sugar disrupting and inflammatory grains and sugars. These cookies use delicious almond butter (or your favourite nut butter!) and chia seeds as the base so they are packed with protein, healthy fats, and fibre, but taste like a sweet indulgence. We made them at one of my classes this week and they were a huge hit, even with the kiddo in attendance! If you need to adjust the taste a little bit to get people on board, feel free to add a little extra palm sugar or maple syrup. Enjoy! These cookies have a soft texture and are packed with nutrition, all while keeping the grains and refined sugars off your plate! 3/4 cup of nut butter of choice I like almond butter! Combine all ingredients in a small food processor and whip together until smooth. You can also beat it together with eggbeaters. Add chocolate chips and stir to combine. Place mixture in the fridge to chill for 5-10 minutes until slightly firm. Use a heaping tablespoon to scoop the batter onto your baking sheet. Bake for 7 minutes then rotate and bake for 3-5 more minutes. Remove from oven, let sit for 1 minute before transferring to a cooling rack. Note: If your nut butter is really runny try adding an extra tsp. or two of chia seeds. The batter will be runnier than a traditional cookie dough; don't panic! Well friend, that’s our delicious bake-and-take treat for the holidays. And if you’re looking for a little extra support on your health journey, make sure you download my FREE 7-Day Anti-Inflammatory Meal Plan & Shopping List right here! Have a beautiful day!